The Cast and Crew for Gina K. Designs welcomes you to another fantastic blog hop celebrating the new Sentimental Summer StampTV kit which is available right now. Take a look at this amazing kit. I hope you are sitting down! We have created some fun projects to share with you today. Hop along on all of the Cast and Crew blogs to see a wide variety of samples. These will give you ideas as you create your own projects with this kit. Make sure to leave a comment on each blog because we will be giving away a prize! We will select one lucky commenter at the end of the hop and that person will win a $50 Gina K. Designs gift certificate. To see who won, check the Big News Forum a few days after the hop. I used the Dazzling Dahlia stamp set and two different papers from the six by six patterned paper pack in the kit to make my card. I black heat embossed each of the stamped items before die cutting them. I wish you could see the shine on those black flowers! Next I made this card using images from the Your Own Kind of Beautiful stamp set. The dies in this kit cut perfectly and are so easy to line up. I did lots of Copic coloring on these images before die cutting them. I used a little bit of patterned paper from the kit to look like a road (or maybe a sidewalk?) Anyway, I love how bright and cheerful this card is. Don’t forget to pop over to the Gina K. Designs Store to check out all of the new products available this month in the What's New section. Thank you for stopping by! I'll see you again tomorrow. Yellow and black is a winning combination! So bright and cheerful. Now I see what you have been coloring. WOW. It's a good thing I don't have to pick a favorite, because I'm in love with both of these! Love the striking back and white plus pops of color! Love your cards, they are beautiful. Great color combos your cards are so pretty! so creative!.. nice work and thanks for the inspiration! The blue on the black patterns is so stunning. A great set of cards. Thanks for the inspiration! Wonderful cards! Loved your color choices! Just a splash of color on black & white...awesome look! Love these! The yellow card screams summer to me! But I have to admit, when I just glance at it (before focusing on it), with that patterned paper - my brain said 'checkered cab' - LOL!! Thanks for all the inspiration! You have some very inspirational cards. I am finding that I like this kit more and more as everyone in the blog has shared their great ideas. I love the blue/black of the Dazzling Dahlia set. So stunning. Love the black and white with blue. Both cards are amazing. Gorgeous cards! Love the black and white with a splash of blue. delightful cards. I especially like the checkerboard "floor" for the bike. I can picture a kid riding there. Great unique color combos. Love them. Great cards! I am in love with all of the black and white designs! Makes the little splash of color pop! Loving this blog hop with all of it's talent and inspiration! Thanks for sharing yours! Those black flowers are stunning. Love the black and white checkerboard with the bicycle. Great designs. Great cards! Great sets!! Lovely!! Love the blue & black color combo!! That bicycle card is wonderful and my fave! I have to say, those black flowers are beautiful and such a unique take on them. Love the black and white dahlia card with the hint of turquoise! LOVE that bike card! Thanks for the inspiration!! great cards. Love the Black White and pale blue. Your cards are both so beautifully made. I especially love the black and blue colored flower one you did. 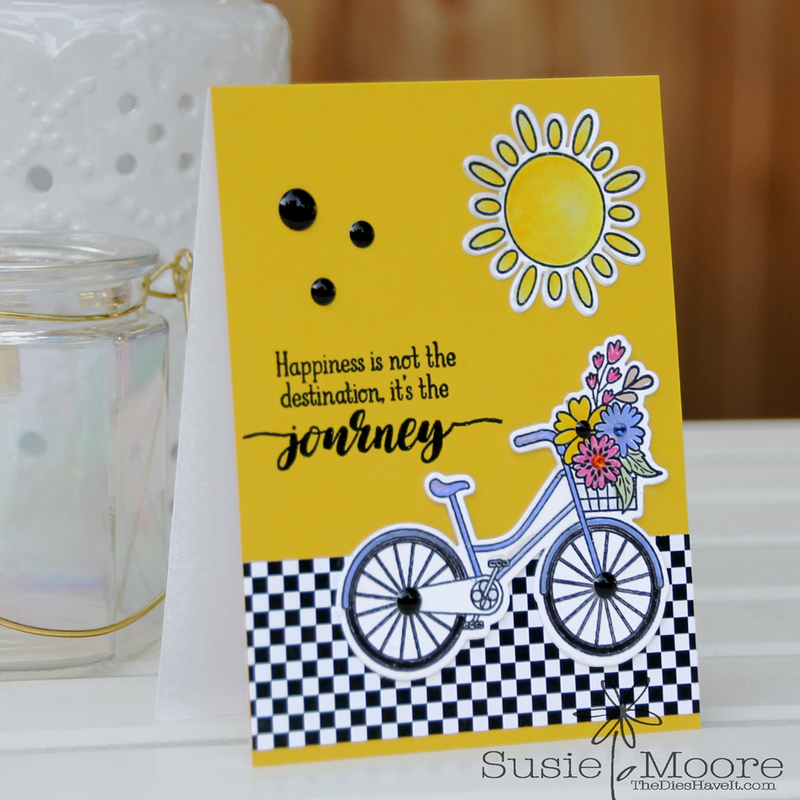 Love your cards - great idea on the Patterned paper as a road! Thanks for sharing! 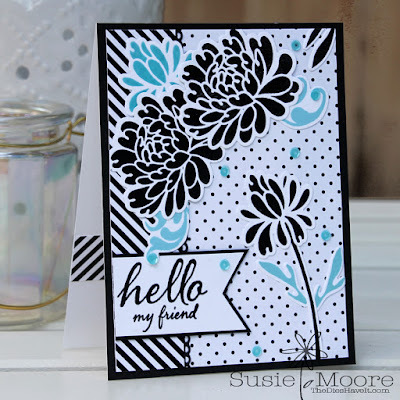 Love the black and white with pops of blue card. Loved your card samples.....beautiful.....thank you so much for sharing them. Your cards are strikingly beautiful!!! Love how you used the patterned paper! I love your cards! I don't usually like cards with black flowers, but the color combination on yours makes it gorgeous! Great stamps from Gina K - I love them all! Your use of black is wonderful! Thanks for the inspiration! Great cards. I like the papers you used. Your cards are so pretty, especially the one where you used the patterned paper. Love this kit. I love your cards. Thank you for sharing! Your cards are so striking! 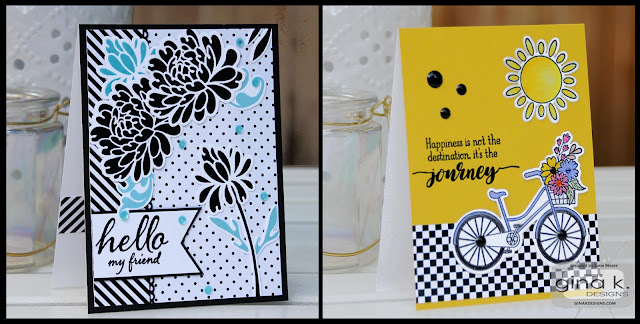 Love black & white with a pop of color, and both of your cards fit the bill! Lovely cards. I like how you have used the patterned papers. Stunning and love the patterned paper choices. Lovey cards! Just so pretty. Black dahlias! Love it. Can't wait to try that technique. Especially love your unique take on the bicycle card! So pretty!!!! So pretty, Susie, I love how you've used all the patterns! Super fun and pretty cards! Beautiful cards! Love the black & white one with the 'pop' of turquoise! Beautiful cards, Susie! I really love the black & white with a pop of turquoise sea....a real stunner! Susie, the black and white on these cards is so striking! Nicely done! Really like the colors you picked for these cards. Great inspiration! Susie love your cards, especially the black and white one with the splash of turquoise sea. I love the black and blue (ouch LOL) card. The combo of the stripes and dots are very pretty. What a cheerful color combo! Gorgeous detail. Love the sidewalk! Great cards Susie! 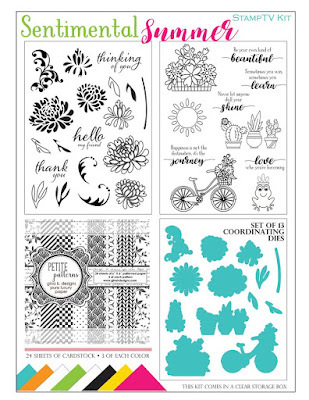 I Love the black & white with the turquoise and the bicycle one is so cute! <3 :) They are both fantastic! These are great cards, Susie! Oh Susie these cards are fantastic I love the blue and black Dahlia. That stamp is the reason I bought this kit. I will be casing your card but with different colors. Thank you for the inspiration for this set. Love it. Well your cards are just a whole lot of fun! They definitely have a presence - thank you for sharing your talent and work! Very pretty cards! I love the colors in the black, white, and blue card. Thanks for the inspiration! Very pretty cards, love the yellow and black. Thank you so much for sharing with us and inspiring us. Love the color combos, nicely done. Beautiful cards Susie. Thanks for sharing. Awesome cards! Love that bike! both of your cards are beautiful! I love the colors and layout of your dahlia card! Lovely cards! But the bright yellow with the black and white plaid bikeway is fantastic! Great color combo.